And back to the Pumpkin Pie Spice creamer mixed into the cream cheese glaze. Separate cinnamon rolls and cut into quarters (about 1" pieces). 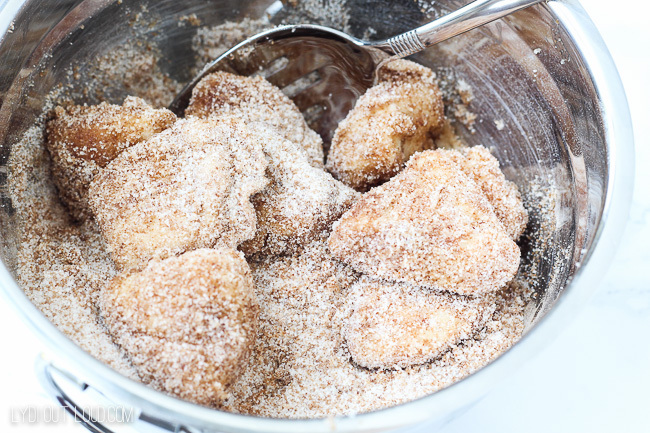 In medium bowl, combine sugar, brown sugar, pumpkin pie spice and cinnamon; set aside. In small bowl, combine cream cheese frosting and ¼ cup Pumpkin Pie Spice Creamer until blended; set aside. Pour ¼ cup International Delight Pumpkin Pie Spice Coffee Creamer into melted butter. Dip cinnamon roll dough pieces into melted butter mixture followed by coating dough in sugar mixture. 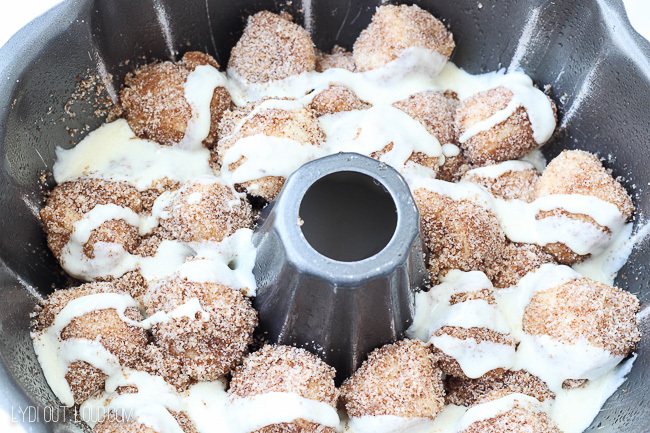 Stack dough balls in prepared pan, drizzling with half of cream cheese glaze at halfway point. Bake 35 - 45 minutes or until golden brown and no longer doughy (will vary based on oven). Allow to cool in pan for 15 minutes. Invert pan onto serving plate and tap the top to release. Drizzle with remaining Pumpkin Pie Spice Cream Cheese Glaze. If you’re excited for fall like me, what is your favorite thing about the season? What is your favorite fall flavor? I’d love to hear in the comments below. This looks so good! It would be great for a fall brunch with company or to bring along for a potluck! Thanks so much Suzanne! Great ideas! I made this exactly as it stated and I even put foil over the top when I cooked it, and the inner ring was really doughy and didn’t cook hardly at all The outer ring was done nicely – so I would add more cook time – I did 40 minutes and even that wasn’t enough. Also, I had a TON of glaze left over. And, I was confused on how to cut up the rolls – not sure if i was to unroll the cinnamon rolls completely and then cut in 1″ pieces (which is what I did and the cinnamon all fell all over) or just separate the rolls from each other (about 6 per can) and then cut in quarters (that would’ve been better, I think). I ran out of the sugar/cinnamon/pie spice mixture to coat the dough with, so I had to mix up more for the second can/top half of the Bundt pan. I will try this again with some modifcations in bake time and preparation. I would recommend NOT using Jiffy mix, it comes out like one big crumbly biscuit, not a pull apart bread. You would need to use more of a dough like grands or something like that. Thanks for the suggestion Melissa! Hello! Does this usually bake evenly? I am planning to bring it to a potluck at work tomorrow and I don’t want the dough to be undercooked in the middle. Thank you! Unfortunately this was way too sweet for my family. The dough was also so sticky I had to add extra bisquick to the mix. And the recipe made too much glaze for us. I would suggest you tweak the directions to say the creamer is divided into 1 cup and 1/4 cups so that folks don’t add all of into the baking mix accidentally. I agree. It’s not worth the time and effort to make. 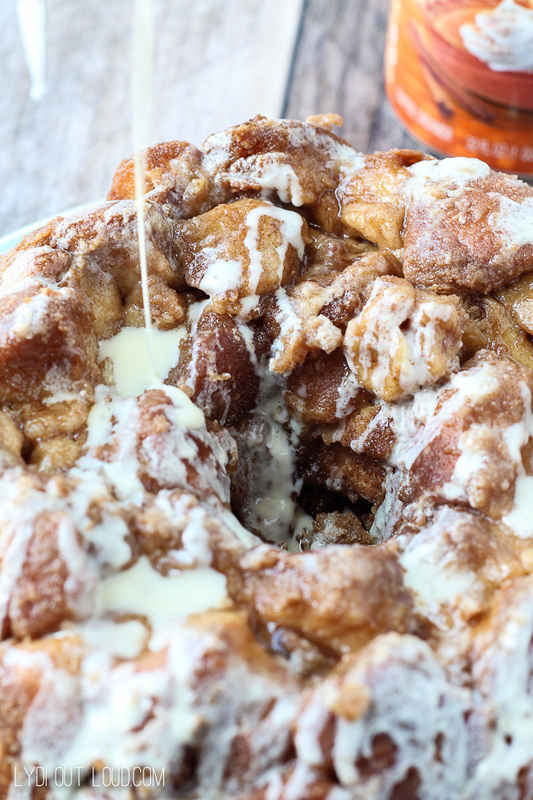 Maybe you can turn it into a coffee cake using the pumpkin spice creamer and less glaze. How much of the glaze do you put in before you bake it? Do you layer it with the dough? And how much do you drizzle at the end? Hi Linda! I drizzle half of the cream cheese glaze over the dough at about the half way point in stacking (once you have stacked about half of the dough in the pan). The remaining glaze I hold onto until the baking is done and drizzle the rest of it on top. I hope you enjoy. Have a great weekend! Thank you to Helen for asking the same question I was going to ask. Any chance to clear that up in future recipes? I was about decided to skip trying this recipe (and more from your site) because of the confusion. Hi P R, thank you for that feedback. I will certainly apply it to future recipes and am grateful that you let me know so that I can adjust the recipe. This looks absolutely fabulous! 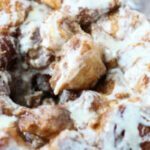 I will definitely be adding this one to my fall “must make” recipes list!! Oh my gosh I have to try this pumpkin-y recipe Lydia! I wish this could magically appear for breakfast this morning! If have it with a cup of Harney & Sons Hot Cinnamon Spice Tea, my other fall favorite! I’m with you on that too David! I hope you enjoyed it and had a great holiday weekend! I luv everything about this dish! I luv pumpkins, I luv spice, I luv monkeys, I luv cream, I luv cheese, I luv glaze and when you put them all together you have just created my dream dish haha! Can’t wait to indulge!